The South Fraser Blog: July 10, 2017 Council Meeting Notes: Rezoning application at 198 Street and 55A Avenue. Being good neighbours during construction. July 10, 2017 Council Meeting Notes: Rezoning application at 198 Street and 55A Avenue. Being good neighbours during construction. On Monday night, there was a public hearing for a proposed rezoning of property located at the corner of 198 Street and 55A Avenue. The following renderings show what the proposed development would look like if the rezoning application was approved. View of proposed development from 55A Avenue. Select image to enlarge. This individual noted that the proponent of this rezoning listened to his feedback when they completed a previous project in the neighbourhood. After the public hearing, I asked the proponent if they had a parking plan in place as well as other measures to ensure that they would respect the neighbourhood. The proponent explained their parking management plan for construction crews, and how they will minimize impacts to current residents in the area during construction. Other important aspects of the proposed development project include enhancements to the pubic realm: streets and sidewalks. Parking plan, visitor parking yellow. Proposed changes to road dimensions. Select image to enlarge. The proposed development hides parking which will be accessed via an internal laneway, meaning that both 198 Street and 55A Avenue will be fronted by ground-level windows and pedestrian entrances that will enhance walkability in the area. This will also form a street-wall which will make 198 Street a more inviting place. 198 Street will be narrowed and 1.8-metre sidewalks will be built in the proposed project area. At the 198/55A intersection, curb extensions will be built to improve safety and ensure that people are not parking too close to the intersection. New street trees will be planted as part of the proposed development, and lighting will be reviewed along the section of 198 Street fronting the proposed project to ensure that lighting levels meet current Langley City standard. 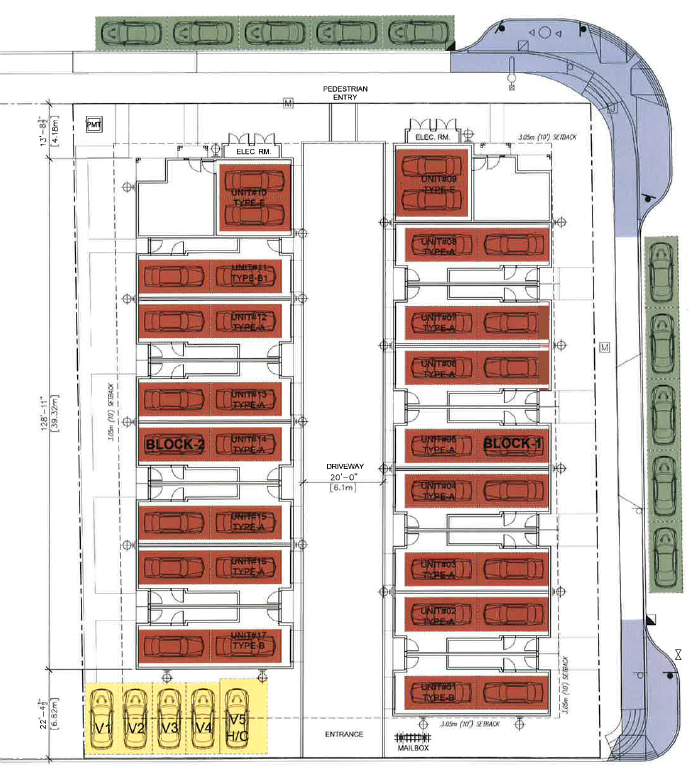 Secure bike parking is also included in the proposed development. The proposed rezoning was given third reading by council.